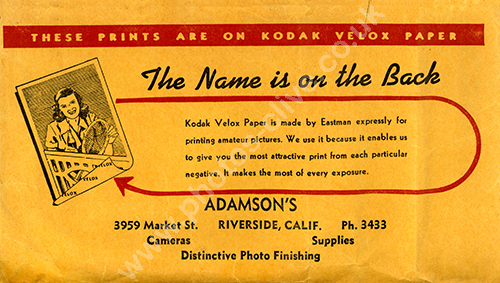 Front face of a 1950s Kodak Velox film and negative packet issued by Adamson's of Riverside, California. For commercial use of this photo, including use on another website, please visit Alamy.com and search for . For a one-off print please see below. Negative Owner Clive Thompson LRPS owns the packet.